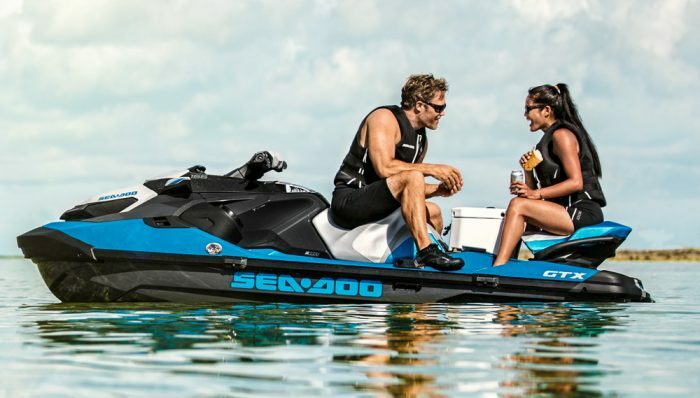 Sea-Doo tossed out a lot of “reignite the industry” talk when it released the Spark several years back. Turns out, it wasn’t just hype or marketing talk. The Spark sold in big numbers, proving that for many buyers all the bells and whistles in the world don’t necessarily make a difference if you can offer a simple, fun, ultra-affordable alternative. 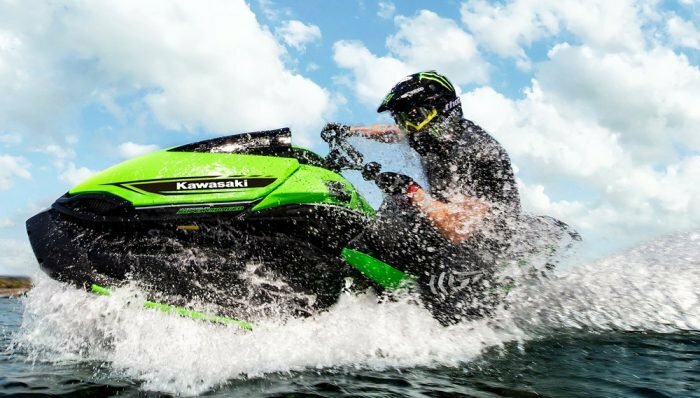 Now let’s dig into our 2017 Sea-Doo Spark review. For those still unfamiliar with the Spark, here’s the two-minute summary. 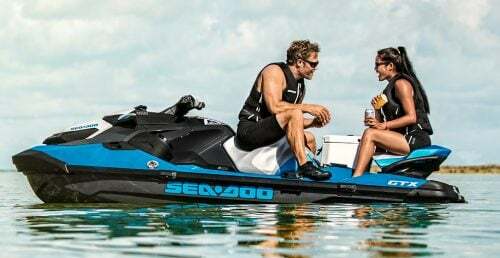 Sea-Doo dropped the price of the Spark so dramatically low, and still kept the craft fun and appealing, by making some outside-the-box decisions. One was to get rid of fiberglass, or sheet molding compound, as the primary building block. Instead, the Spark’s hull and deck are fabricated from a composite the manufacturer dubs PolyTec. In technical terms, it’s polypropylene, reinforced with long-strand fibers of glass. It’s surprisingly strong and lighter in weight than fiberglass. One side benefit is that Sparks don’t need a typical SUV tow vehicle, but can be towed by nearly any automobile. Primarily, however, that lighter weight allowed a second choice – a lower horsepower engine than what most buyers had become accustomed to. The Rotax 900 ACE was the first of what has now become a series of Advanced Combustion Efficiency engines. In its base form it’s as low as 60hp, which is good for about a 40 mph top speed. On a boat that’s light and playful, it’s not half bad. Still, we’d strongly suggest optioning up to the ACE HO. 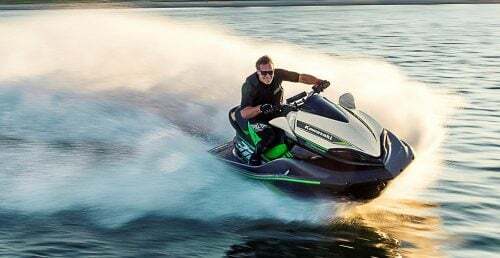 Its 90 hp will push the boat to a more pleasing 48 mph, but more importantly, give the engine some welcome snap and acceleration, both off the bottom and in the midrange. 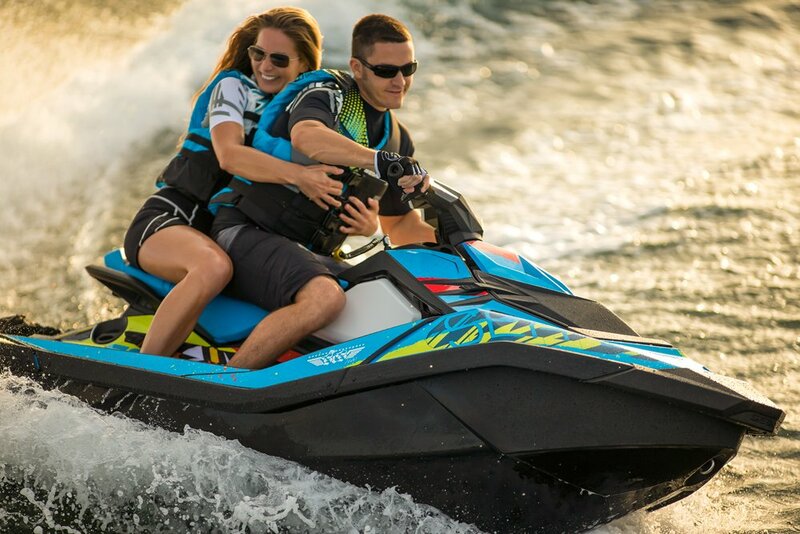 That added power is almost necessary to bring out the most in the Spark’s playful hull design. It carves when desired, but its greatest strength may be its ability to go old-school. 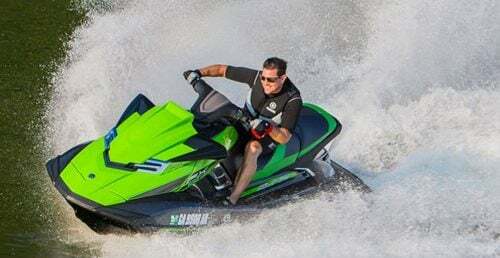 Speed across the water, crank the bars hard and shift your weight, and the Spark will spin out in an old-fashioned 180, or with a little finesse and throttle, a full 360. 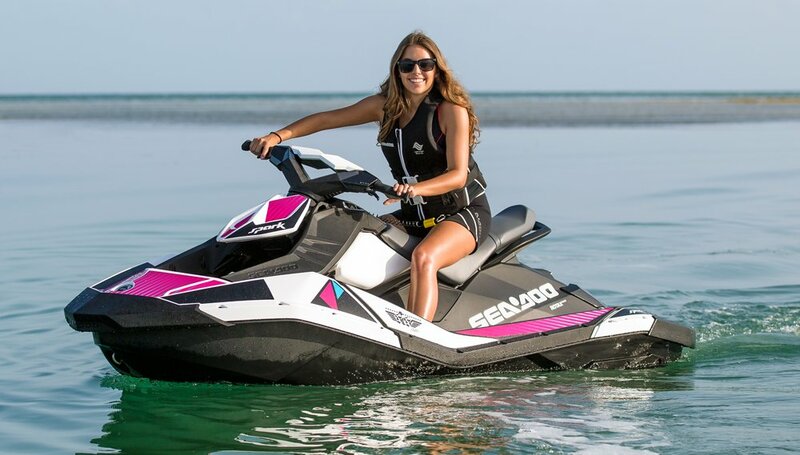 The 90hp model also brings in Sea-Doo’s familiar Touring and Sport acceleration modes, meaning you can keep the boat tame when you want, then give it that added snap with just the push of a button. The Spark’s design is somewhat radical. 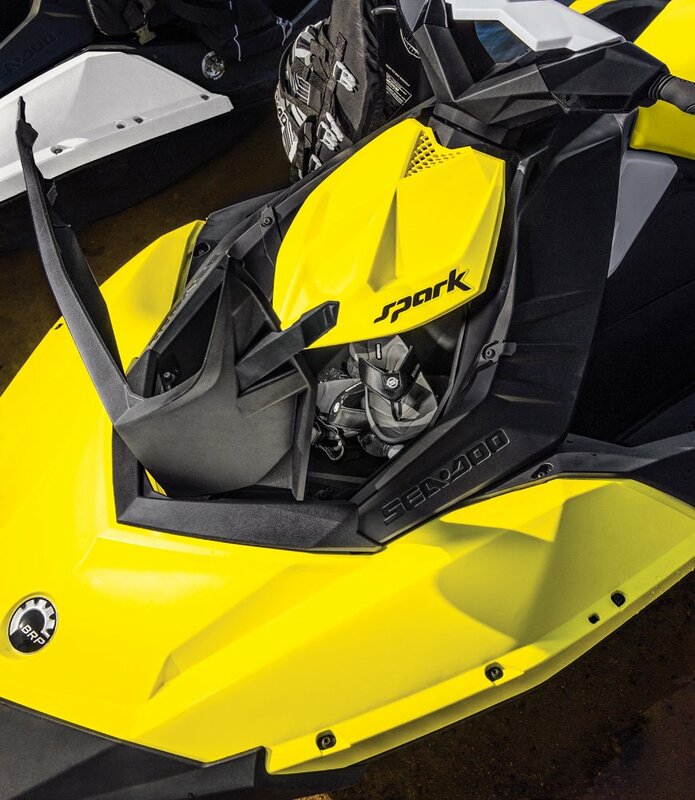 To further trim weight, the craft in stock form has an open bow, with the handlebars supported on a wishbone-like column. 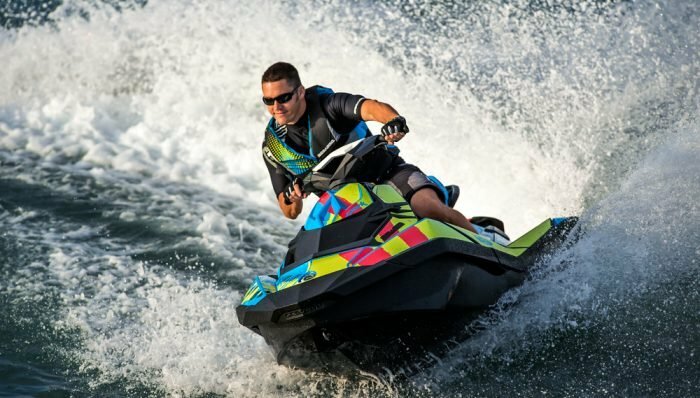 Sea-Doo calls it ExoSkel. A 7-gallon storage compartment, which plugs that stylish pass-through, is a $140 option. As PolyTec can’t be bonded with adhesive like ‘glass boats, the hull and deck are also sandwiched together around a rubber gasket and bolted. As to engine mounting, large metal plates are placed outside the hull, to which the engine thru-bolts into. Those plates double as heat exchangers for the engine’s closed-loop cooling system. As PolyTec can’t be painted, colors are molded in, and result in a matte finish. The current color lineup continues the Spark’s bold flair, and includes Blueberry, Chili Pepper, Key Lime, Vanilla and Pineapple. The base Spark comes as a two-seater. A longer three-seat configuration is also available. Clearly consumers have taken to the Spark, as the craft has led PWC sales since its introduction. 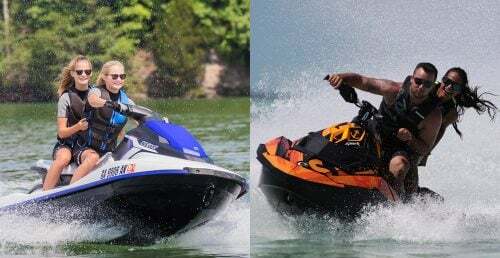 Competitors, however, have taken aim at it, prompting Sea-Doo to release a series of humorous, but pointed videos to answer criticism. For potential buyers, the topics are worth considering. One subject is PolyTec’s durability, an issue responded to with a video showing the hull being hit with both baseballs fired from a pitching machine as well as a baseball bat. (The latter, in fact, has been used live at boat shows.) As to scratches, a Japanese chef is shown chopping vegetables atop an overturned hull. Members of the press were treated to another video that upped the ante to an axe. The obvious weight advantage of the Spark is covered in yet another clip. The final one tackles storage. 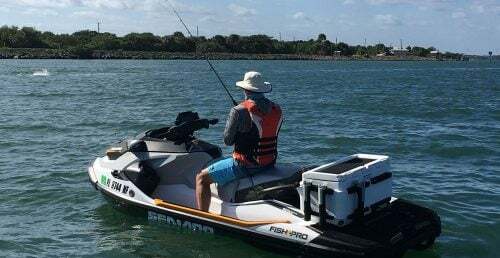 True, the Spark comes without stock storage space, but its optional tub is large enough to fit practical items like a life vest. Our take on all of the above? Yes, we’ve seen cracked Spark hulls, but they mostly seem to be a result of serious wave jumping in the surf. In normal usage, the hull and deck seem pretty tough, and in fact will fare better in some instances than more brittle fiberglass. The material’s matte finish also resists scratches, although like all PWC the sticker graphics can be vulnerable. The Spark is in fact the lightest craft on the market. And though than storage comes at a (minimal) price, it’s big enough for commonly carried items. More pressing concerns in our opinion are what type of water you’ll be riding on. The Spark is designed for smaller, calmer waters ideally. We wouldn’t recommend it for choppy coastal waters, in large part just due to its small length. Those looking at the Spark would also be wise to look at models in the next closest Recreational category. In many cases, once you option the Spark up to a three-seater with 90 hp ($6,499), or 90hp three-seater with the available Intelligent Brake & Reverse (iBR) and storage ($7,499), the price comes close both the brand’s own Recreational-class models as well as similar models from competitors. Is there anything new on the Spark for ’17? No, unless you count the Spark Trixx model, which adds extended-range nozzle trim (and extended reach handlebars as well as foot chocks) to allow for more freestyle-oriented moves. Sure, some new colors would be cool like how Apple frequently refreshed early iMacs, but this is only the second year of the current crop. More colors are likely to come down the road. Sparks can also be customized with wide-ranging graphic kits. 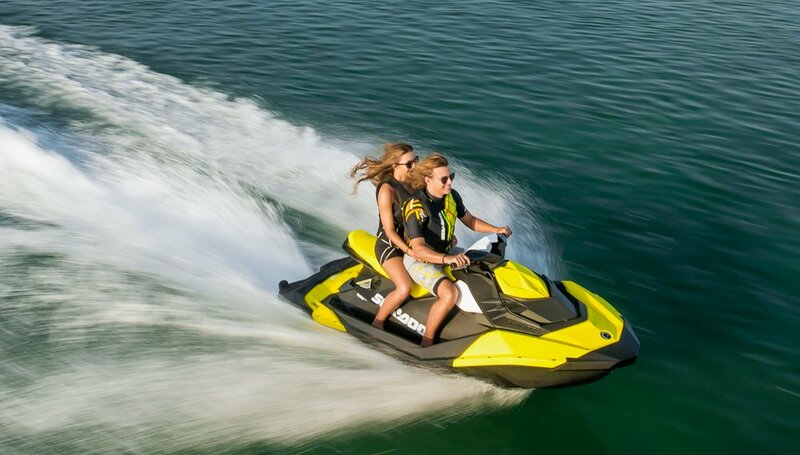 In summary, Sea-Doo’s got a good thing going, and for the time being it knows it. 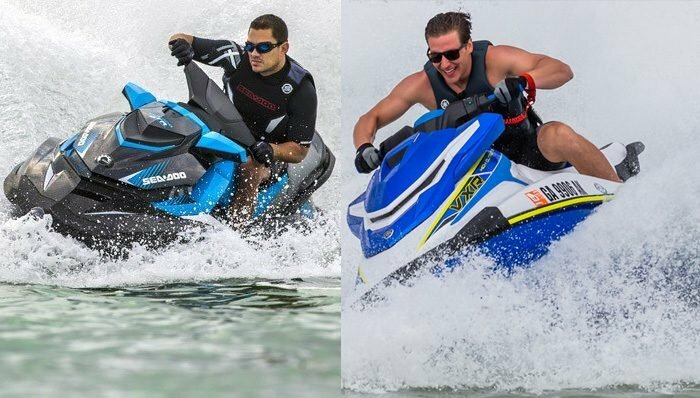 Yes, Yamaha has now entered the Rec Lite category with its EX models, which are worthy of strong consideration. But the Spark remains a little bit cool, a little bit quirky…and a lot of fun. At a starting price of only $5,299 for the base version, that’s an enticing combo.